In general, if it's trashed face up take damage, if it's trashed face down, don't. With the odd Kraken-trash of a rezzed ice not doing damage, even if it's trashed face up. Another vaguely notable effect is that cards like Sub Boost are hosted as a counter, so if you trash an ice with Sub Boost installed on it, you take 1 net damage, not 2, as you trash one card and one counter. @McKindling: Agreed on all points however by wording it would not seem as though this card's ability is triggered by Noise's ID ability. Noise: Hacker Extraordinaire states that when his condition is met "the Corp trashes the top card of R&D". 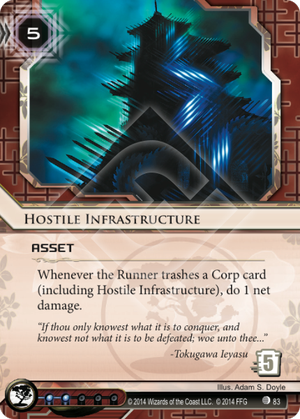 Hostile Infrastructure I suspect was cleverly phrased by FFG so that the card would not completely shatter Noise. It certainly hurts Imp though which is a staple of Anarch. Hostile Infrastructure is a damn funny 1/2-of in horizontal decks. With the growing popularity of Apoc in various aggro decks rezzing one of these after their third central run is surprisingly effective. Think about it from the runner's perspective. They just finished making all the runs, probably didn't see many cards, likely spent a bunch of money to do it, and now they have to go knock over your stupid spiky castle instead of blowing everything up? UUUUUUUGH NO. Hostile Infastructure does something incredibly powerful: It ties together credits and net damage, allowing decks to tax the Runner through both at the same time. This has a huge effect on most runner economies because they rely on one-use cards like Sure Gamble that are not great when you are taking damage. After all, if you have to spend two cards and a click to trash a single PAD Campaign you are really going to suffer and you'll suffer more when you don't have two more cards to spare. Tying credits and net damage also offers some benefits: Damage takes away economy cards and playing around damage is inefficient, which makes gathering credits harder. And more time spent gathering credits means less time drawing cards, making net damage stronger. It also has lots of benefits that makes it incredibly dangerous: It makes even the weakest asset untrasheable under risk of opening scoring windows. It nullifies Keyhole, nerfs Parasite and makes upgrades indestrutible when paired with Fetal AI or other damage sources. And it stacks, which is amazing. The drawback is a big fat cost: Hostile Infrastructure is the most expensivenon-economy asset in the game and the goal is to keep two of them rezzed on the table. Of course, the Runner won't allow it so they'll trash it at any cost, meaning you need to bring it back and rez it back again. Very few decks can play both the taxing game and the damage game and even fewer can do that while racking in enough credits to play this card. But they exist and in their hands, Hostile Infrastructure is really powerful. A very powerful card that not only protects itself, Sundew, and other assets but with a few of these out a runner may not be able to trash a shock, a snare, or cards in hand. Better yet, it protects against keyhole and really hurts noise decks. I predict this card will see wide spread play, especially in RP decks. SNARE! would do 4 net damage with if the runner wants to trash it from RnD or HQ. Project June bug, Cerebral Overwriter and such do an extra net damage if the runner wants to trash them after access. In general, 0 trash cost now becomes one-net-damage trash cost. This will probably be interesting in Jinteki: Chronos Protocol decks: every time the runner trashes a card, the Corp gets to snipe one card. It would be interesting to see if anyone comes up with an intentionally delicate trash cost build to make this card shine; somehow always forcing the runner to make a tough choice between thrashing and taking net damage or letting the Corp keep a card that will cost them later (Caprice Nisei or Ambushes).